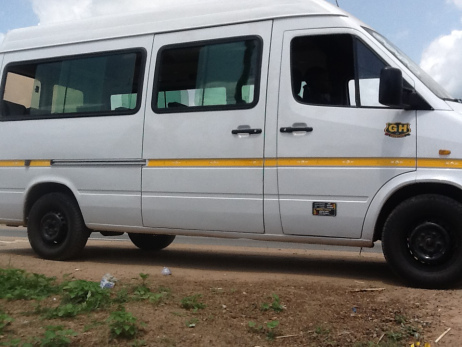 We need a van (32 seater bus) …for picking up our children. Our school is separated from the community by a very dangerous highway…our kids can not cross it by themselves. We need this bus (this picture is of our dream bus!) to bring our children to school safely. At least 40-50 children are not attending our school because we lack this safe transportation. Please donate to this worthy cause! Dora Oakley is a leader of women in Samsam. Why? People come for her advice. Dora works out of her home. Now that Samsam has electricity, she purchased a freezer to store fish and chicken. She owns a Chop Bar (restaurant) – she cooks and has 2 helpers. She has run out of capital but still wants to grow. Needs: Capital $1,000 for building, kitchen equipment, tables, chairs, signage. Filomina Mensah sells cooked rice in Accra. She cooks at home first half of each day and travels to Accra to sell. Needs: Capital $250 to build inventory and train others to sell for her. Kitchen equipment. Joanna Kateikai has 3 children – 4 years to 18 years old. Joanna sells tea and bread in the mornings. Evenings, customers come and sit & talk at her “café”. Her sister helps her go to the local bakery to buy bread. Needs: Capital $300 for signage, tables, chairs, lanterns and displays. Linda Lampley sells cassava dough, onions, eggs and red peppers, okra. Her store display includes canned tomatoes, smoked fish and beans. Linda lives behind her market. Olivia wakes early to cook a rice and bean pocket that many enjoy for breakfast. This burrito-style food is easy for villagers to carry and eat on their way to work. Olivia cooks out of her home, a one room kitchen, storage and shelter for her children. Needs: Capital $500 to purchase a kitchen, inventory. Rebecca sells soap on laundry day. She saw a need and created a business! 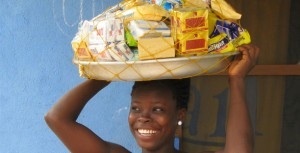 Rebecca travels 35 miles to Accra and purchases soaps, both personal bars and soaps for laundry. Then she carries it all in a basket on her head throughout her community. What a convenience for the women! Needs: Capital $350 for rent of storefront and inventory storage. Imagine living without a sink to wash your hands. Your donation of $40 will provide a convenience that we take for granted. Your $40 will improve sanitation practices, teach children the benefit of washing their hands before eating, and reduce disease. Mothers can use this to wash their children’s hands and faces, as well as their own. You can make a difference for a family with a simple donation of $40. Use the Paypal button on this page. Your donation is tax deductible. “Thank you Joy2theWorld!” Women clients of the micro loan program were given an opportunity to “win” a Bucket to take home! The word spread like wildfire that those who arrived to the Open Forum early would be included in an early raffle draw. 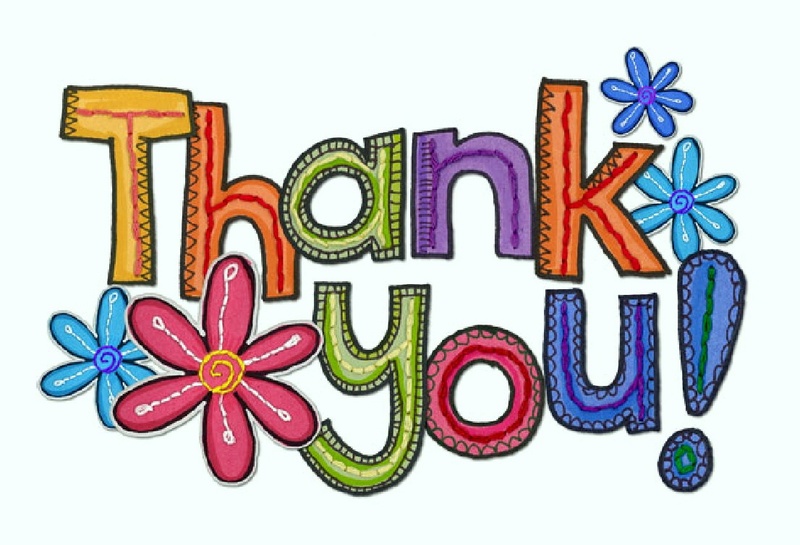 Thanks to generous online donors and matching donations from J2W, 45 buckets were raffled to an audience of over 125 women in attendance. These precious buckets provide a “faucet” (spigot), easy access to wash hands and faces at home. Raffle drawings provided the fairest approach to distributing the buckets to the crowds. Ten tickets called at 10 am (those early arrivals at the meeting), then again at 11:30 a.m. and noon.